We’re pleased to announce the launch of the new V1.6 North Paw kits! These kits are very similar to the V1.5 kits, except that the enclosure has been changed to a small black plastic box. This change was made mostly because it was very very time consuming to make the laser cut acrylic enclosures, both for us and for our customers; these new enclosures snap together in about 1/10 of a second! Minor improvements have been made in other places: the battery is now physically smaller and more rigid (increasing safety), the velcro dots are now much less likely to go missing during transit, and the confusing R1 on the rear of the PCB has been moved back to the front thanks to a superior, smaller, layout. Get more information on the North Paw page, or read the new instructions. Announcing at long-last the logging version of Heart Spark! 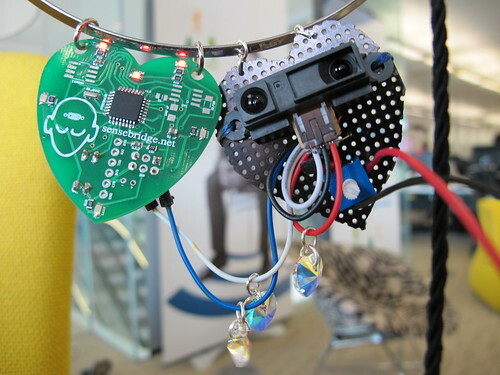 It collects data on every beat of your heart, for up to 14 hours. Then you can go an plot it and make pretty charts & graphs. We have a very limited number of Heart Spark Logging beta units available. Beta means this is not the final product, changes are still taking place in the code, bugs are being fixed. But it’s not alpha: all major features are present and the software is totally usable. If you’ve been waiting for a truly open heart rate monitor, your wait is over. We sure are excited to hear from a bunch of new people after this Wired article. But, it did hit us a bit by surprise; we had yet to update our North Paw inventory numbers as we were right in the middle of getting more kits together. But fear not! More kits are ready now, so order yours here. 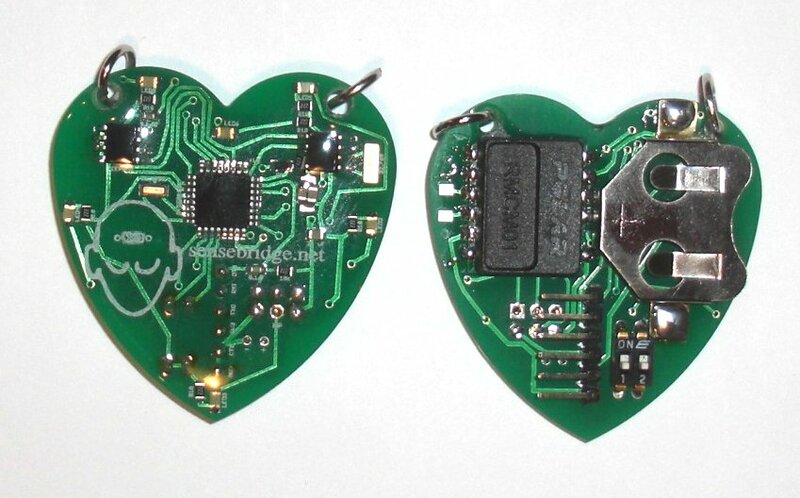 I’ve made the product page for Heart Spark, our new blinking pendant! 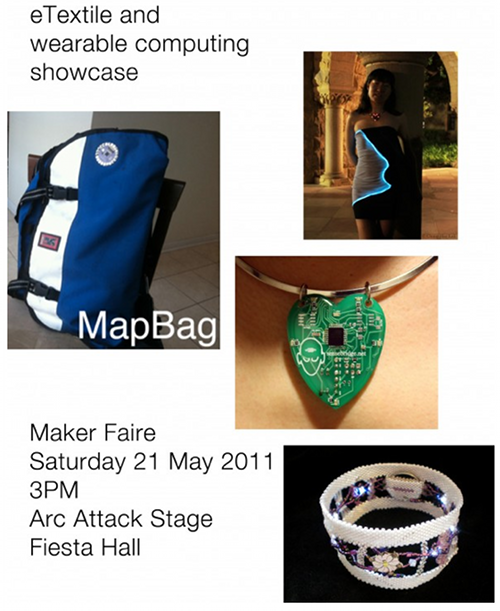 I have only a small number available at the moment, but more are being assembled rapidly. There is a lot of labor per pendant – by the time you count all the soldering, programming, testing, epoxying and packaging, it’s over an hour per pendant! But I think the final result is super stunning, I’ve been getting a lot of comments when I wear mine around. And I’m a man! On a lady it should be spectacular! Anyway, check it out and let me know what you think. The logging version should follow in about a month, once I get the software side working a little bit better. Heart Spark is almost ready to go on sale. I have received the first lot of boards from China, assembled and tested the first one (works! ), so sometime this week you can expect to see a limited number for sale here. Currently I am assembling them myself, it takes about 30 minutes of delicate surface mount soldering per board, plus extra time for programming, testing and the all important attachment of the jewelry bits, of course :-). 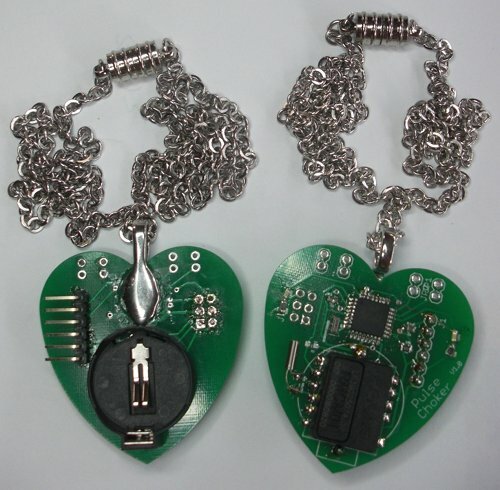 I’ve been working on a new product for sensebridge tentatively called the HeartSpark. 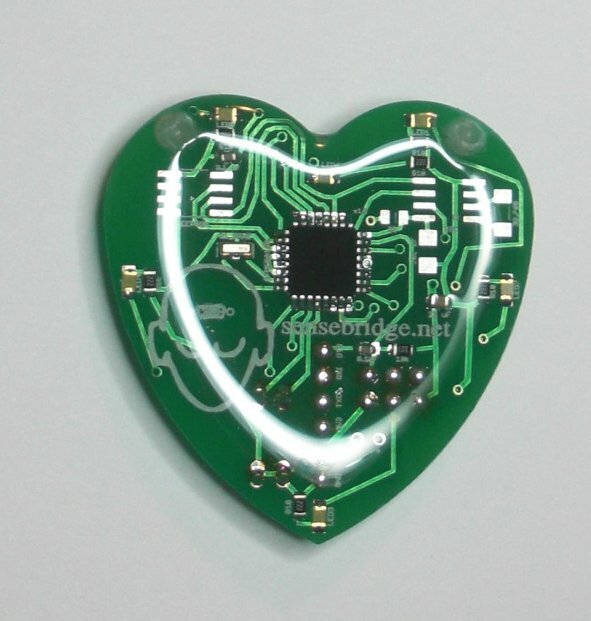 It’s a heart-shaped pendant that flashes LEDs in time with your heart beat. It pairs with a polar chest strap & transmitter to acquire the heart-beat info. The product version will include a Real-Time-Clock chip and an EEPROM, which will allow the user to log data all day log. I plan to make software in Processing which would allow easy retrieval and plotting / saving of this data. 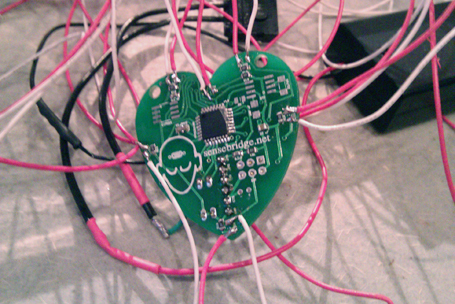 But I’m also super excited about the social possibilities of broadcasting your heart-beat – I had some very interesting conversations with people at the Ottawa Mini Makers Faire, including one memorable conversation with an older woman who said that she felt “slightly dirty even looking at it” because she felt that my heart-beat was really private information… Anyway, second round of prototypes should happen around the beginning of December, and I’m hoping to have product ready for the start of next year. If you’re interested or have feedback about the design, please send me an email! Next batch of North Paw kits is done! After rather more weeks than we’d have liked, the next batch of North Paw kits are shipping. Many thanks to those of you who waited patiently for three or more weeks for them to be ready. All shipping is complete for paid orders. Pretty straightforward, right? Well, at any stage in that process, there is an enormous amount of detail, and occasional snags. It’s pretty clear how getting the armatures sewn up could be highly detailed, I’m sure. Well it turns out that there’s complexity even in ordering parts. In many cases we could order parts from a number of different suppliers, with slightly different prices and different shipping times and costs. Bundling is necessary. Minimax for ALL the parts, though, fails when you run into someplace that is out of stock but doesn’t say that up front… especially if you have already placed orders with other vendors. Must flash the code onto all the ATmega controller chips. We have a jig for doing this. For other parts, there’s a fair amount of chopping up to do! The velcro, the cabling, the heat shrink tubing, even the static resistant foam all come in larger pieces than required for the kit. This is really easy to do, but takes some time. When it’s time to pack the kits up, a bunch of little Dixie cups are great for sorting, and you can just pour the parts from the cup into the bag. Remember to print stickers to close the bags up with! Did a business card get into each one? The one snag that is at all interesting is this. The acrylic enclosure is cut to fit precisely over the slots on the board. In this batch of boards, the inner corners were rounded, not square, so the acrylic didn’t quite fit all the way. I ended up grinding down these inside corners rather than trying to redesign the enclosure, so they should all fit perfectly again – if you find that yours doesn’t, it’s easy to use a tiny grinding wheel or even a small file to trim it a little farther.